An Activity for Twenty to over Sixty+? The course is made up of numerous rope ladders, 42 exciting crossings to include the Double Stirrups, Zigzag Trapeze, Flying Carpet and Canyon Crossing, 2 Tarzan swings and 5 zip lines. Overall, there are 5 individual sections within the course, each section taking you higher into the forest canopy and finishing with a zip line longer and with more expansive views of the pond than the previous one! Zip Line #4 and #5 are both well over 650 feet and the entire course consists of over 2,191 feet worth of zip lines, providing some of the longest zip-lining experiences in the state and region! I know that our young-uns would be excited for the experience, but what about us “mature folks” . . . would we survive over 2,000 feet of zip lines? These zip lines, an aerial runway consisting of a pulley on a cable, work on gravity pulling the passenger down to the end of an incline, with zip very much the appropriate word. Our physically fit youngsters had no trouble with any of the challenges and even selected the more difficult options, such as walking on rings hanging from ropes. For me, the hardest part was climbing up the rope ladder, which required strong arms and upper body strength. The rest of the course, high in the trees, presented a variety of moveable walkways. Sometimes I decided not to look down. 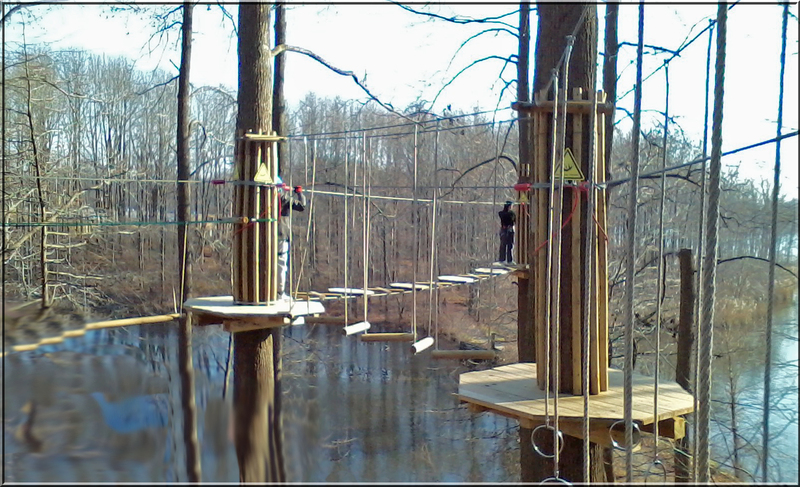 After getting over the initial fear of stepping off the platform for the ride on the zip-line, the trip down over the pond was thrilling! On the last zip line, I held my cell phone, video taping while gripping the cable with two hands. So if you want to see if the zip line experience is for you, that video is at the end of the movie. Everyone had a great time and even making plans for when to return. Maybe we’ll make this a family tradition! Congrat’s, looks like everyone had a great time at the Pond. Not sure I would step off a perfectly good platform but I give all of you a big Atta-Boy for doing what you set out to do. Thanks for all you have done for us in the past, I have really enjoyed all of your post and look forward to seeing more. Hi John, yes, I have to say I questioned whether it made good sense to step off that platform. When I told one of my students about our experiences zip lining, he told me his story where he tried going reverse on the line, almost leading to disaster! I guess for some the thrill of just going down isn’t enough! Thanks for commenting on the blog! Best wishes.